2. 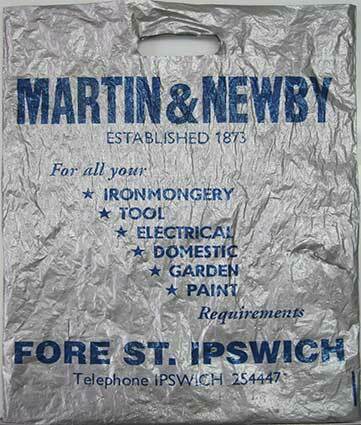 See our Martin & Newby page for this very lettered company and store. 3. The national nostalgia-fest retail chain that was Past Times over-reached itself with more than one branch in some towns; it had a long, gruelling death as a result of the global meltdown in 2007-8. The Ipswich branch was at 19 Butter Market. 4. 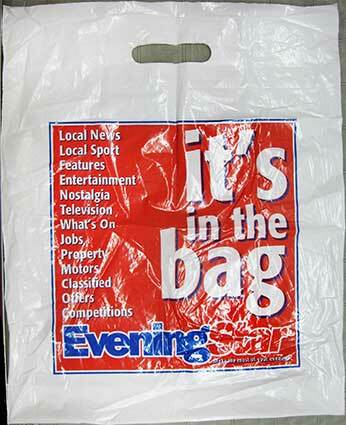 A newspaper once existed in Ipswich called The Evening Star, but it started life in 1885 as The Star Of The East. 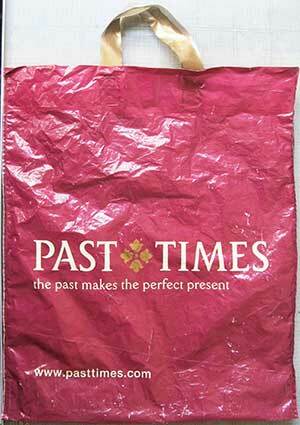 Although its vintage is perhaps the turn of the twenty-first century, this promotional bag evokes a time when the Star arrived through the letter-box every weekday afternoon with the green-'un on Saturdays, featuring the football results. Part of the EastAnglian Daily Times stable of publications, it was printed and published from rather fine buildings in Carr Street, opposite the original Co-operative store; there were demolished to make way for the misbegotten 'Carr Precint' which had that tumbleweed feel to it for the public and for those brave, unhappy shopkeepers who tried to make a go of it there. It is now a pound-shop. The move to new offices in Lower Brook Street followed, but printing onsite eventually ceased and, in 2015, the business is leaving the site. 5. Ah... British Home Stores was the national chain at the mercy of asset-strippers and the Ipswich branch in Butter Market closed in 2016. The company was founded in 1928 by a group of U.S. entrepreneurs to emulate the success of Woolworth's. It had a total of 163 stores mainly located in high streets or shopping centres by the time of its closure, as well as 74 international stores across 18 separate territories. So many people lost their jobs. 6. The Ipswich branch of Jones Bootmaker (trading as 'A. 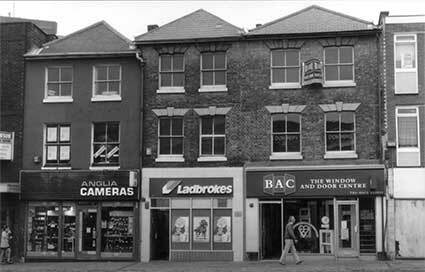 Jones & sons') in Butter Market took over the former Alderton's shoe shop after the disastrous fire which started in Hughes Electrical and swept through the Booksale remainders shop and the shoe shop in 1992 (stopping short of The Ancient House). In 1857 Alfred and Emma Jones opened a footwear shop in Bayswater, London. 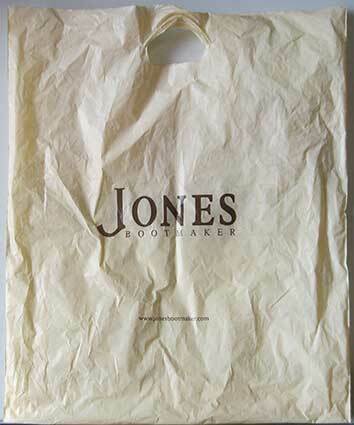 Jones was a pioneer in the installation of electric lighting in retail premises. Nine of their eleven sons became apprentices and subsequently store owners, trading as A. Jones and sons. A company innovation was the supply of ready-made shoes in three widths. Trading as Jones Bootmaker from 1996, the company went through a long string of being bought and sold by hedge funds and investment groups. 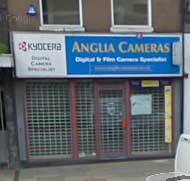 The Ipswich branch closed in August 2017; there were seventy-two shops still operating elsewhere in Britain in 2018. 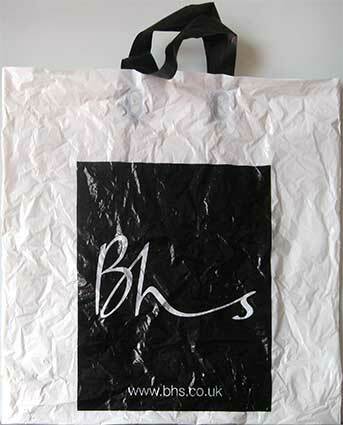 As determined recyclers/reusers of bags, who knows, we might have an old Woolworths bag in the understairs cupboard or up in the loft... Or even The Ancient House bookshop, Hatchards. 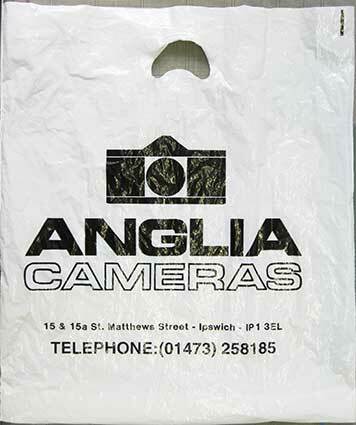 If any browsers of this website have examples of trade bags branded with lost businesses, please use the link below to contact us.